Thank you so much for coming here! My name is Raina Rose. I am a folksinger, mom of two and potion maker living in Austin, TX. I grew up in Portland, Or with legit hippie parents. 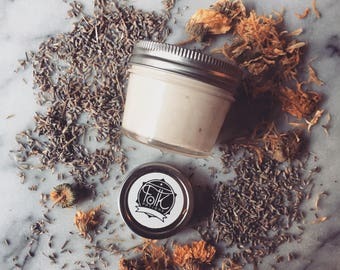 I started making simple + organic skincare after high school when i lived and worked at the summer camp i grew up attending. It seemed so natural, while living on the Oregon Coast, to find our plant allies, harvest them and turn them into medicine. Something as plain as a bright yellow Calendula flower, has taken the energy of the sun and the earth and turned it into incredible healing power. How beautiful is that? I spent ten years on the road playing songs for people, and then when I had babies, i realized i needed to re-envision my path. Touring constantly with small kids did not feel good to me, and if it doesn't feel good, it's time to shift directions. I focused back on things I love to do and making healing unguents in my kitchen was a natural course. Music and healing go hand in hand. I like this natural deodorant. I got the tangerine one. It would be nice if it came in stick form but overall it works great! I love all of her products! Honestly you can't go wrong with anything you purchase. The body butters feel amazing! Love the minty lip balm, hydrating and tasty! Smells great! Magic in a bottle! Love this stuff! It feels silky and hydrating on my face!